The face on display dates from around 4,500 years ago. 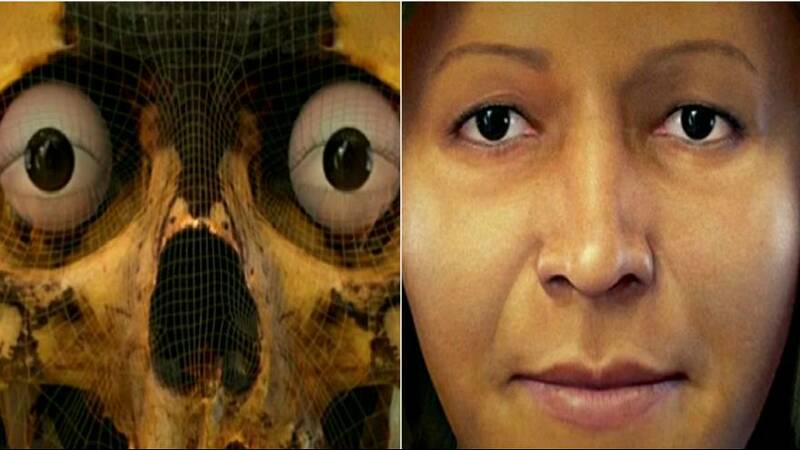 Researchers in Peru have taken the mummified remains of a woman discovered last year to reconstruct her face digitally using 3D technology. The “Lady of the Four Brooches”, as she has been named, is thought to have been middle-aged and is believed to have had an important social status in the ancient Caral civilisation. The computer graphic artist who spent months on the project says the biggest challenge was redesigning the skull. “We can’t just reconstruct without looking at the history, without talking to field specialists to help with this important and unique job of reconstructing the face,” Cicero Moraes said. The woman’s remains were found at an archaeological site north of Lima, in the ancient fishing village of Aspero near the city of Caral, the most ancient civilisation of its kind in the Americas. The discovery sheds new light on the important role of women in the ancient gender-equal society. Along with the mummy of the woman, archaeologists also found artefacts, such as carved objects of birds and monkeys, jewellery, shells and other offerings in the tomb, lending to the belief the woman, who was between 40 and 50-years-old when she died, had an elevated status in her society. The Caral archaeological site is a UNESCO heritage area and is believed to date as far back as 5,000 BCE.